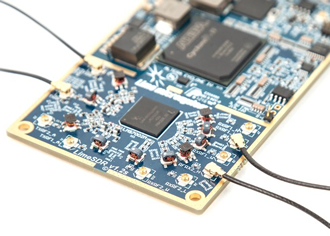 Lime Microsystems has launched an open-source RF initiative to widen the community of developers and aid RF innovation. Launched as a non-profit initiative, Myriad-RF aims to give both hobbyists and experienced design engineers a range of low-cost RF boards and free design files available for general use. Future board designs will come from the wider Myriad-RF community, with the first board (Myriad-RF 1) designed by Taiwanese distributor Azio Electronics. ad-RF boards use field programmable RF transceivers to operate on all mobile broadband standards - LTE, HSPA+, CDMA, 2G - including all regional variants; and any wireless communications frequency between 0.3 and 3.8GHz. This includes the regulated, licensed bands and unlicensed / whitespace spectra. Lime has also beta-launched the Myriad-RF community website and forum, www.myriadrf.org. This resource will also house the board design files and example projects with how-to guides and the ability for users to contribute extra content. Designs hosted on myriadrf.org will initially come from Lime and close partners, but Lime seeks to increase involvement and design contribution from the general RF design community - both hobbyists and professional system designers. Azio's Myriad-RF 1 board measure approximately 5x5cm, uses a 5V power supply and is software configurable to operate from 300MHz to 3.8GHz and on 2G, 3G and 4G communication networks. Pre-built boards will initially retail for $299 or less. Innovation only really happens when a large number of minds tackle a problem, and by going open-source we can slash the hardware costs and open RF innovation up to as many people as possible, said Ebrahim Busherhi, Lime CEO and Myriad-RF creator. We're trying to create an Arduino for the RF sector; a board that's low cost, powerful, exceptionally flexible and easy to use. And, most importantly, we're trying to let the community determine what's required, letting them add the functionality they need. A distribution network is already in place for pre-built boards and components with Azio Electronics and Eastel already on board. Links to all available pre-built boards can be found on the Myriad-RF board pages.